The document attempts to capture the design, construction and development of my Ashland, BC Frend Track module. Ashland is a fictitious small town located along the CN main line in British Columbia Canada (the name is a contraction of two places in BC that I am familiar with: Ashcroft and Peachland). 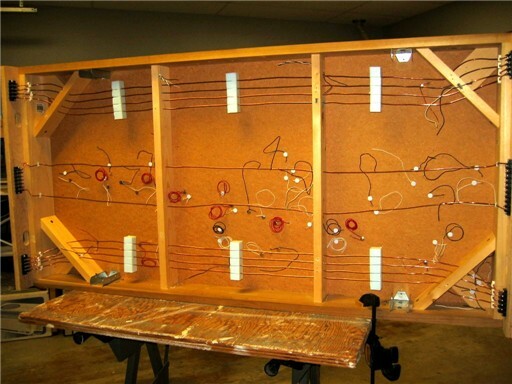 This module began life as a 4' Bend Track module in the early months of 2000. At the time I did not yet own a digital camera so I don't have many pictures of the construction phase. 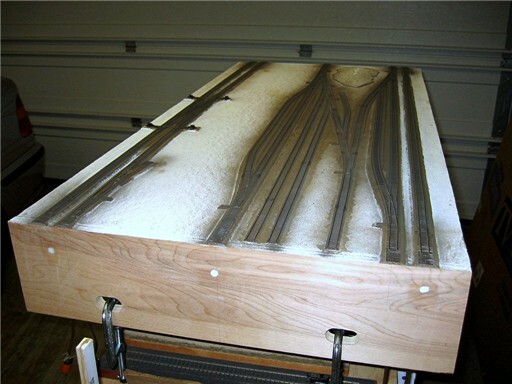 The frame is constructed of 1 x 4 clear poplar hardwood. 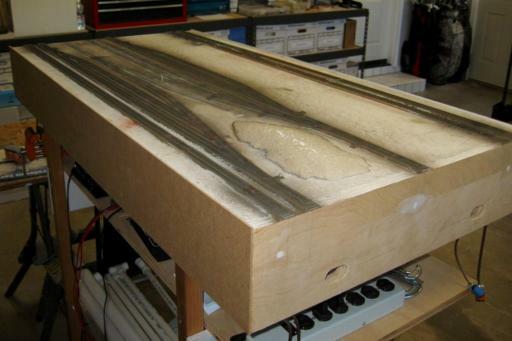 The sub-roadbed surface is ½" sound board from home depot. 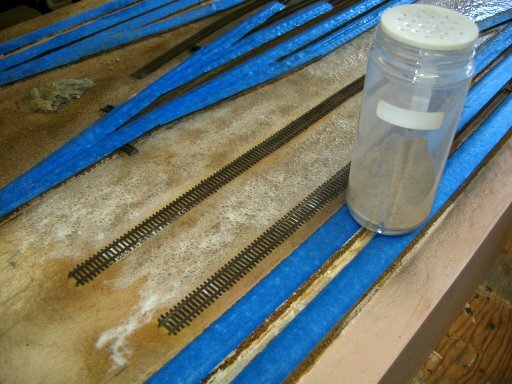 As per our groups standards the track and turnouts are Micro Engineering Code 70 glued to cork roadbed. It stands on four legs that set the rail at 50" off the floor, the standard height for Bend Track modules. As my modeling skills improved and my interests in prototypical modeling increased I was exposed to HO free-mo modular layouts in early 2001. 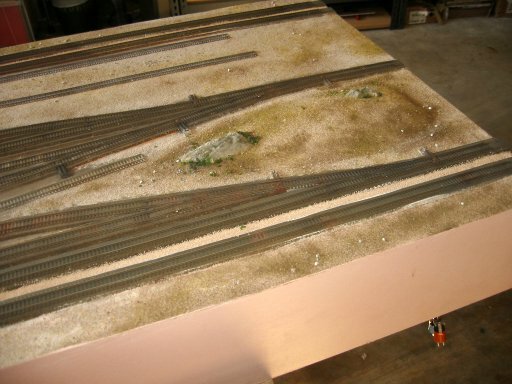 Free-mo focuses on prototypical model railroading by specifying a single mainline down the middle of the module. I was intrigued by this idea and immediately embarked upon a crusade to adapt the free-mo standard to N scale. I'm happy to report that the free-mo N scale group is now alive and well. In an effort to leverage the investment in my existing modules I proposed the Frend Track standard which is simply a combination of Bend Track and free-mo for N scale on a single module. 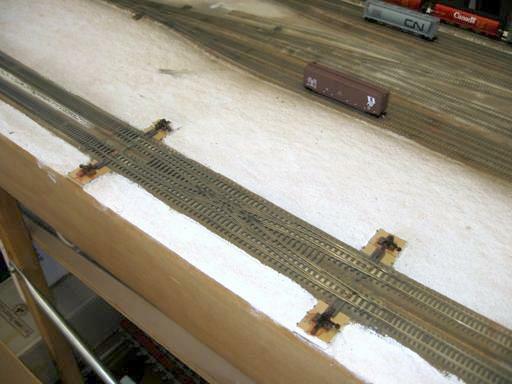 To prove that such a beast is possible I began converting this Bend Track module into a Frend Track. The remainder of this document presents that effort. 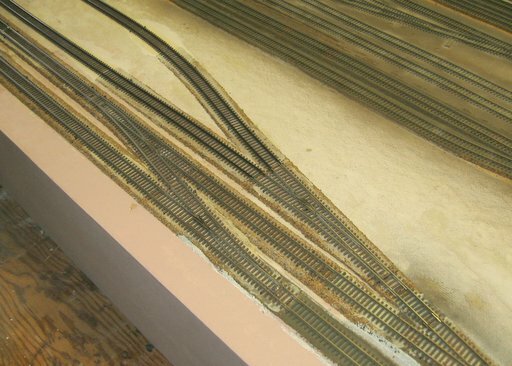 This photo shows the results of converting my Bend Track module to a Frend Track with the addition of the free-mo main line track down the middle. The module is shown attached inline with my two Bend Track balloon modules. The free-mo section is all Micro Engineering code 55 track and turnouts. At the top left corner of the photo you can see the short 2-car DC/DCC interchange track. 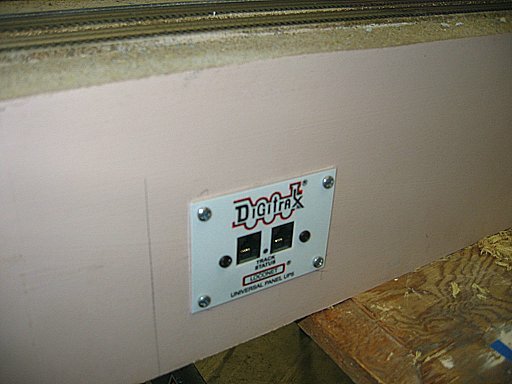 This allows the transfer of equipment between the Bend Track mains (normally DC) and the free-mo yard (DCC) that includes a switch to isolate the electrical when the systems are incompatible. At this point the track is wired and ready for scenery. This photo shows the new 6" free-mo endplates laminated to the existing 4" Bend Track endplates. A full 6" fascia will be added to the side rails to extend the height to 6" also. 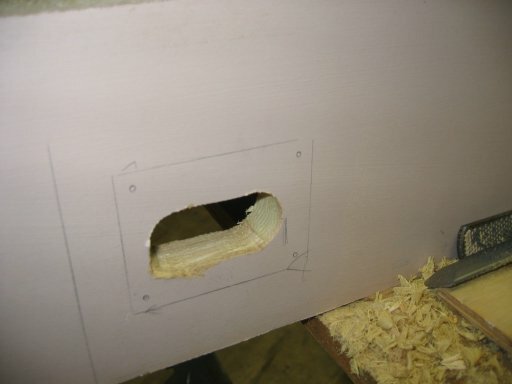 The holes were cut in the endplate to facilitate clamping to 4" endplates. 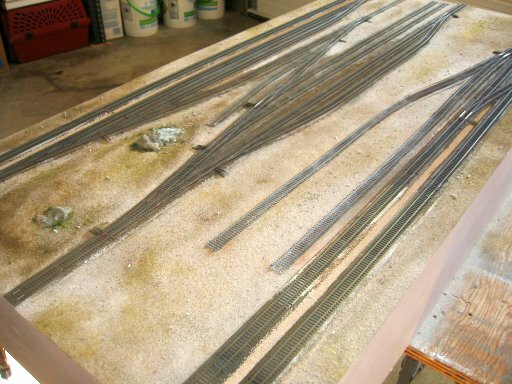 Here the track and rail have been painted prior to weathering and ballasting. 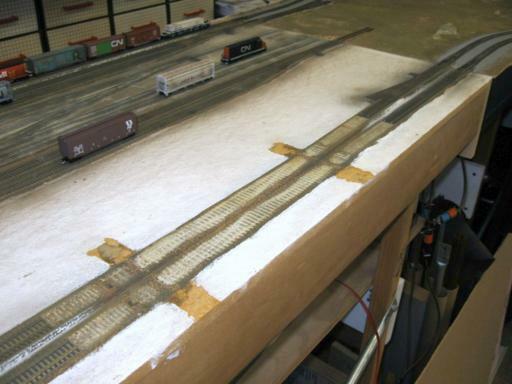 I use a spray brush to first paint the track from above with Grimy Black then I spray the rails from the side with a Rail Brown / Rust color. My original attempt at wiring my Bend Track mains was inadequate and basically incorrect. After reading "Basic Model Railroad Wiring" and speaking with others on the internet I learned the errors of my ways and decided to correct it. Here I have run four bare 12 gauge copper wires under the mains to carry the track power from one end of the module to the other. Track feeder wires will then drop down from the track and solder to these bus wires. 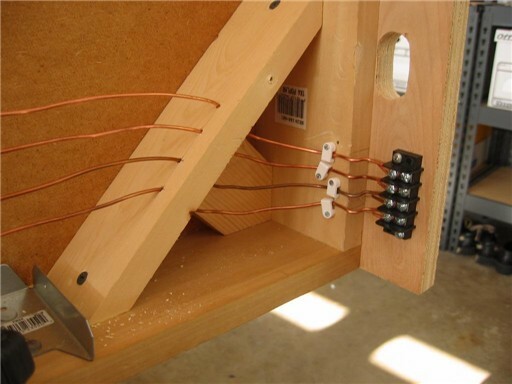 This photo also shows one of the 2x4 joist hangers I use to hold the legs in place. 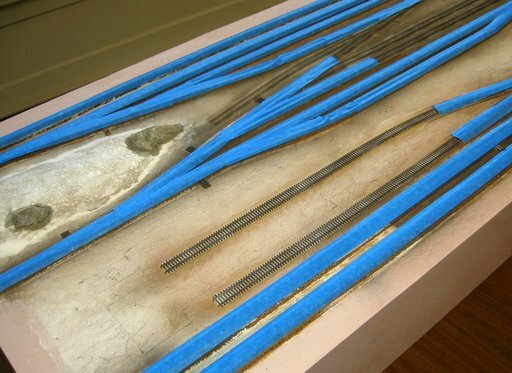 Here the track bus wires have been securely affixed to a 4-position terminal strip. Pigtail module connectors will be attached here. This is the underside of the module showing the track bus wires running the entire length of the module for one side of the Bend Track mains. The two bare wires running down the middle are the track bus for the free-mo section of the module. The lamp-cord wires along the top of the module are my first, incorrect, attempt at wiring (what was I thinking). 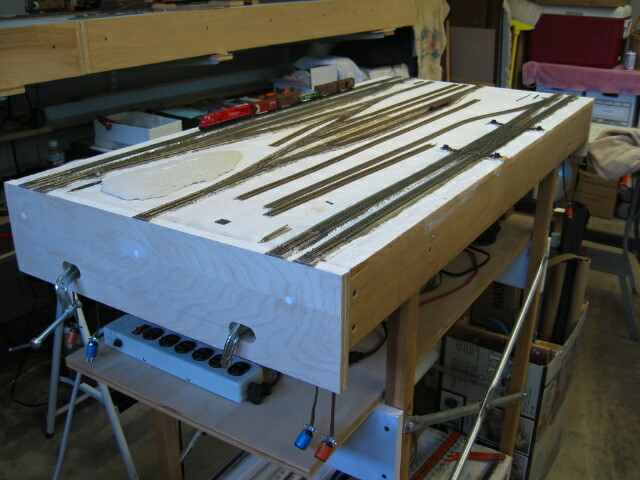 The track feeder wires (24 gauge black and white wires) are hanging free awaiting soldering to the bus wires. 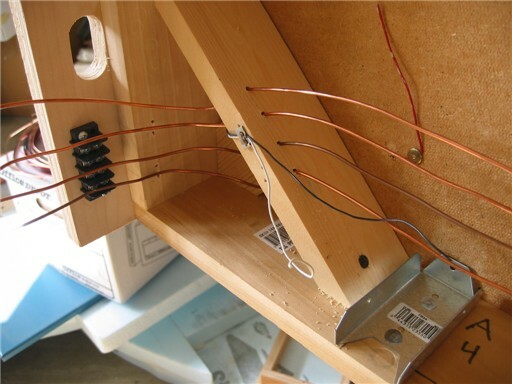 I use thumb tacks to provide strain relief for the feeder wires. 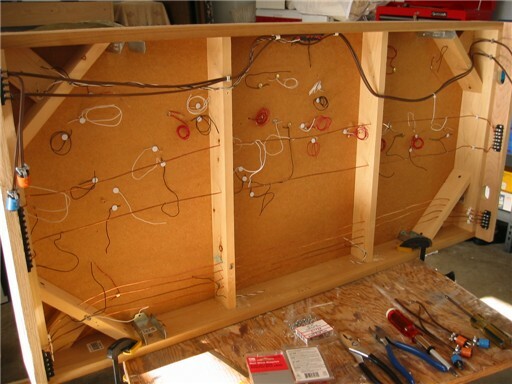 The red feeder wires are soldered to the underside of the turnout frogs for future power routing. Rewiring of the track power bus for the Bend Track mains is complete. I used strips of foam to keep the bare wires seperated where appropriate. The track feeders have not yet been attached to the bus wires. Still need to add the accessory power bus for both the Bend Track and free-mo sections. This photo shows the Shinohara code 70 double crossover in place on one side of the Bend Track mains. 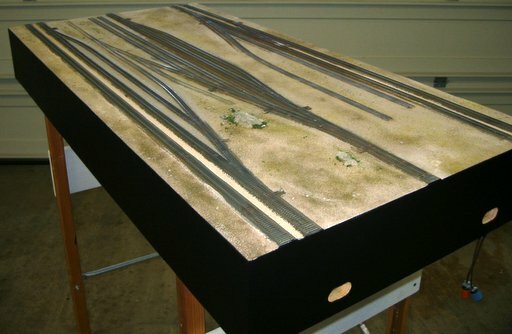 I have grown tired of the un-prototypical look and scale of this unit and the oversize manual ground throws attached to it, especially when viewed alongside the ajoining ME track and turnouts, so I have decided to replace it with a couple of ME code 70 turnouts before I continue with any more scenery work in this area. Here the Shinohara turnout has been lifted from the module by cutting the mains back far enough to where the track centers are 1½" apart. This narrowing of the mains was necessary to transition from the 1½" Bend Track standard spacing to the Shinohara 1¼" crossover spacing. Also the cork will need to be replaced since it was shaved down to accommodate the un-prototypically thick ties on the Shinohara turnout. 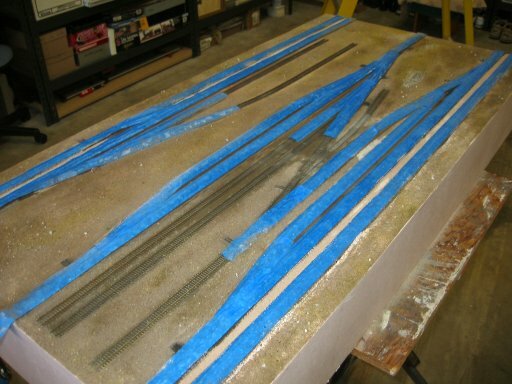 The 1/8" hardboard fascia panels have been glued to the side rails (available from Home Depot in 2 x 4 sheets). I use regular carpenters glue and many clamps to attach the fascia. This results in a smooth even surface when painted and doesn't require any filling of screw holes. At this point the top of the fascia has not yet been contoured to match the surface features. I like to do that after the glue has set. The fascia material is soft enough that you can shape it with a wood rasp and sand paper. Here I have replaced the un-prototypical Shinohara double-crossover with a single cross-over using ME turnouts. 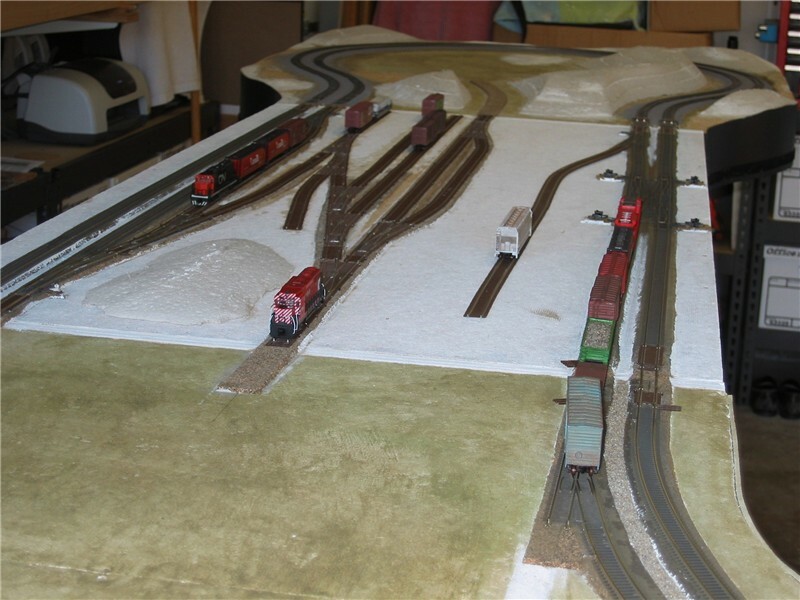 I have also added the turnouts and spur tracks of the Bend Track main that will service the local industries. The entire module has been minimally scenicked and the fascia has been painted according to the Frend Tracl standards. The track still needs to be ballasted before I can say this module is show-ready.